Maura Healey addressed supporters at the Fairmont Copley Hotel on Tuesday night after her victory over Warren Tolman. Political newcomer Maura Healey trounced party insider Warren Tolman for the Democratic nomination for state attorney general Tuesday night, putting her in a strong position to become the first openly gay attorney general in the United States. 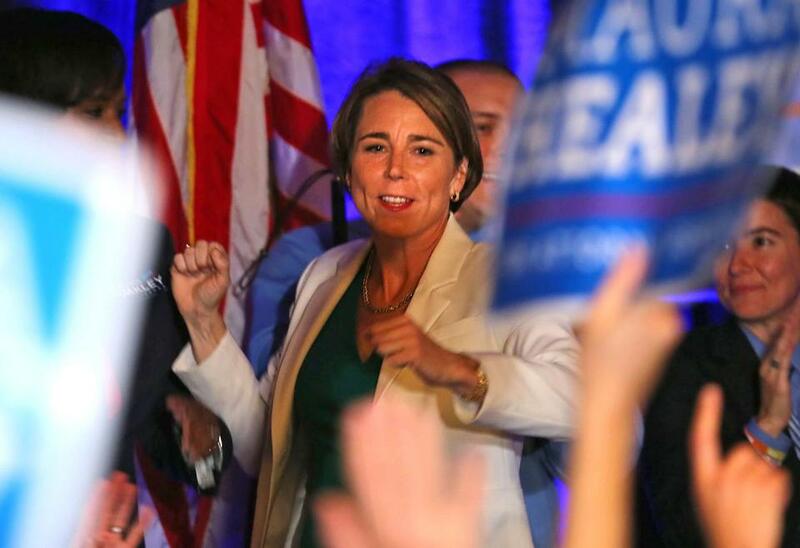 Riding support from women’s and gay rights groups, Healey overwhelmed Tolman’s more traditional coalition of organized labor and elected officials in a battle of some of the most powerful constituencies in the party. In a speech at the Fairmont Copley Plaza hotel, Healey thanked supporters for backing her “underdog” campaign and pledged to fight for homeowners facing foreclosure, students bullied in school, and workers cheated out of wages. “These are the fights that have driven this campaign from the beginning, these are the fights that matter, this is what this is about,” she said, to applause. See town-by-town voting totals in the Democratic primary election. With 94 percent of precincts reporting, Healey led Tolman, 62.4 percent to 37.6 percent, racking up big margins from Boston’s affluent suburbs to liberal enclaves in the western part of the state, while edging Tolman in blue-collar cities like Quincy. Healey, a former assistant attorney general, will be the heavy favorite in a general election match-up with Republican John Miller, a lawyer who ran uncontested in the GOP primary on Tuesday. With little drama ahead of the Democratic gubernatorial primary this year, the attorney general’s race drew more attention than usual — from voters, party activists, and interest groups. Martha Walz, the president of the Planned Parenthood League of Massachusetts and the organization’s political wing, appeared in a campaign video for Healey, deployed door knockers, and loaned the candidate four summer interns. Tolman, a former state senator, had strong support from the state’s AFL-CIO, run by his brother Steven. And he won endorsements from Governor Deval Patrick and Mayor Martin J. Walsh, who had more than 700 volunteers on the streets and on the telephone Tuesday hoping to drive up turnout in neighborhoods expected to go Tolman’s way. Tolman’s deep roots in Massachusetts politics gave him some institutional advantages. But Healey generated early buzz as a sharp, energetic figure with the potential to galvanize liberal and women voters. Tolman did not cede ground with either constituency. He pledged to take on the National Rifle Association. And his first television advertisement highlighted his support, as a state legislator, for Massachusetts’ buffer zone law, which was designed to protect women entering abortion clinics. Polls showed the race deadlocked with just weeks to go. But the Globe’s most recent survey, conducted Sept. 2-3, showed Healey surging into the lead, with women breaking sharply for her in the closing days of the campaign. The poll came a week after Tolman dismissed a Healey attack as “unbecoming” in a Boston Globe debate. The remark was little noticed during the debate, but Healey’s supporters called “unbecoming” a sexist term and turned it into a fund-raising plea. Tolman apologized, but his backers called the broadside a cynical distortion of his comments and touted his record on women’s issues. It was unclear what impact the dustup had on voters. Healey is one of three women who won Democratic primaries for statewide office Tuesday, alongside gubernatorial nominee Martha Coakley and Deb Goldberg, who won the party’s nod for treasurer. She is also one of two openly gay nominees, joining Steve Kerrigan, the Democratic candidate for lieutenant governor. Healey, 43, started as chief of the civil rights division in the attorney general’s office and went on to run two prominent desks in the office: the Public Protection & Advocacy Bureau and the Business & Labor Bureau. Healey pledged to be a dogged prosecutor, in the mold of Coakley, while Tolman, 54, pitched a broader, more political view of the office. He said he would use the attorney general’s bully pulpit to push colleges into a more vigorous response to the campus sexual assault crisis and to pressure drug companies to stem opiate abuse. Healey dismissed Tolman’s approach as little more than grandstanding; Tolman said Healey’s view of the office was too narrow. Even as the Globe poll showed Healey pulling into the lead in the closing days of the campaign, Tolman was hoping he could take advantage of high-profile endorsements from the governor and the mayor of Boston. But at midday Joseph M. Rull, a high-ranking aide who ran Walsh’s field operation during the mayoral election, said the race would ultimately come down to the candidates and their messages. Tolman lost Boston in the end. But, as expected, he fared better there than in the state as a whole. Video: Election day around Mass.